The first installment in the Dark Ditties series, The Offer, introduced us to the world of Maximilian Francis Benoit - a secretive and strange old man whose motivations for giving away millions to a group of seven complete strangers were highly questionable. (Not to mention, homicidal.) 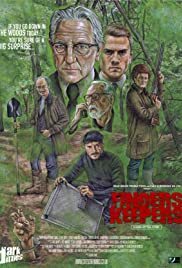 The third installment, Finders Keepers, allows us a glimpse into what happened immediately before that fateful night, including a hint at who the "winners" of the game were, and what they are planning to do in future episodes. It also lets us know whatever happened to Annie Wiltshire, and gives us a hint as to why the Gimp was so freaking insane. It seems that Mr. Benoit has both loyal and disloyal staff in his employ. After one of them steals an important briefcase, Benoit sends two hitmen to retrieve both it and the thief. Unfortunately for said thief, two bumbling idiots happen to wander by and accidentally kill him ... setting off a series of unfortunate (and pretty darn funny) events. It was wonderful to hear references to characters and expansions on backstories which had been introduced in the first two episodes, and it's becoming a bit of a game with fans to find all the prop "Easter eggs" and shoe references. See how many you can catch! Brilliant performances by all the cast, as per usual. Special kudos to Mark Wingett, who makes his hitman character Frank Hardy both tough and occasionally clueless. (The gun barrel conversation in the gas station had me absolutely rolling.) Oliver Smith and Bruce Jones are simply hilarious as the clueless Smiley brothers. And the always-fantastic Simon Bamford as the unfortunate would-be thief Mr. Wainwright ... well, he was just adorkable. Sean Schafer Hennessy delivers yet again with an incredible soundtrack that will send chills up your spine every time you hear Teddy Bears Picnic from now until the end of time.. So once again, Dark Ditties Presents delivers on the scares and the laughs. Great job, fellas!